Great question, DJ. It seems as if LEDs (light emitting diodes) are popping up everywhere these days, and for good reason—they’re more affordable, more efficient, longer lasting, require less voltage, and don’t get hot the way traditional incandescents do. When you’re comparing LEDs to a 1,600-watt HMI that gets so hot you could fry an egg on the fixture, there are both advantages and disadvantages. For example, one downside to working with LEDs is that, if you get hungry on a job, you can’t easily make yourself an omelet on your light. HMI fresnels are traditionally used to light up sets around the world—but what are they? HMI stands for hydrargyrum medium-arc iodide lamps. A fresnel is a type of lens that was originally developed for lighthouses, and in this context essentially refers to a lightweight type of lens that has the ability to focus light into a beam. We’ve been experimenting with the Litepanels Sola lineup of LED fresnels. The Sola 6+ and Sola 9 have been with us on virtually every job over the past year. 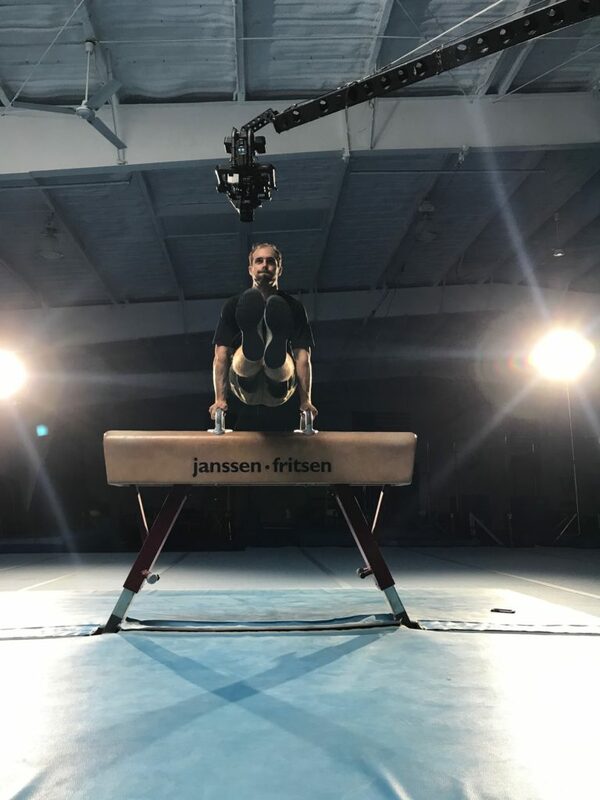 We’ve also brought in the Sola 12 on occasion, such as on this recent production for the International Gymnastics Camp, which you see in this BTS image. Lighting expert Bryan Liscinsky whipping out a glorious LED-lit L-sit. He swears he wasn’t sore the next day, too. 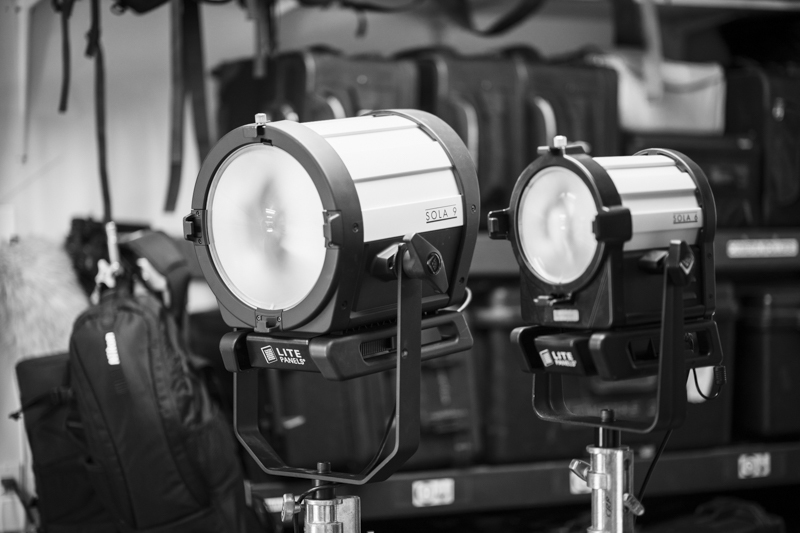 The Sola lights contain the same directional fresnel lenses that you’re probably accustomed to using in traditional HMI fresnels—the only difference is the light source is LED. LED lights require a fraction of the power, which is often a huge advantage depending on your location. You can run an LED off a small generator or even a battery pack, whereas an HMI might decimate the entire electrical grid of that quaint old-world European village you’re shooting. With LEDs you also don’t have to worry about the bulb breaking or burning out—these lights will last virtually forever. In interview situations, LEDs put off less heat, which, again, is bad for frying bacon but it’s good for interviews. With LED lights, you’re going to be spending less time wiping sweat off your interview subject’s face. The proverbial hot seat is literally less hot! And that results in better content—a better interview—simply because the subject will be more comfortable. So, what are the drawbacks? LEDs are objectively less powerful than HMIs. When you’re working in that 1K and under range, we’re going with Litepanel Solas all the way. But as soon as you need a 2K fixture, we have to switch over to traditional HMIs. For most situations, we’ve been really happy with the performance of our Litepanel Solas. I’d highly recommend giving them a try because they’re going to offer better performance and versatility most of the time. Let me know how it goes!